According to Wikipedia, The phrase mobile commerce was originally coined in 1997 by Kevin Duffey to mean “the delivery of electronic commerce capabilities directly into the consumer’s hand, anywhere, via wireless technology.” Current definition is, mobile commerce is the process to buying or selling products and services through wireless handheld devices like mobiles, tablets, smart phones etc. Few years back eCommerce revolutionized the process of buying and selling stuff. It gave you liberty to buy and sell stuffs on desktop computer from your home or offices. Now a days eCommerce seems to be hurdle in transacting online with advent of hand held devices having internet facilities. 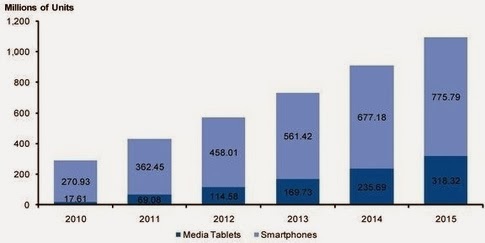 Now a days people are using more smart phones and tablets than desktops and notebooks. See the chart below, it grew up rapidly and expected to grow up in coming years. Smart phones and tablets are used normally in day to day operations. Todays hand held devices are far more advanced. It lets you browse Internet, it gives you big storage, it gives you high computing and processing power. So what’s the impact of mobile commerce on your business? Mobile commerce can impact your business in number of ways. For example if you are running an online store, your customer may access your store from smart phone or tablets and it may be possible that your website does not look good on it and they may not buy the products. With the Google Play store and iTunes store, user can download number of applications on their mobile devices and can use those applications for their needs. So if you are offering some services and you don’t have any mobile friendly website or application, you are loosing your customers or you are not reaching to enough customers. Because there are chances that customer search on mobile devices and they did not find you. Although you were able to provide service to your customer but just for the reason they can not find you, you loose the customers. 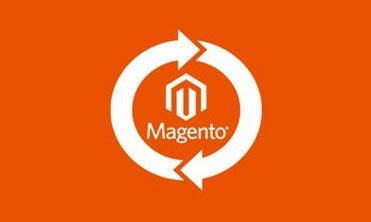 Why your current eCommerce web site is not good for mCommerce? Mobile devices have limited screen width and height and your current website will not work properly. For example if you have fixed height and width in your website, on mobile device user have to frequently scroll left- right or up-down to see the content of the site. This is very awkward for users as they are not able to see content properly. Customer may be traveling or walking they have one hand occupied, then they may not be able to scroll or eventually they will close your site. Current navigation of your website may not be useful. For example you have navigation menu where user can hover mouse and the sub menu is displayed. This type of navigation will not work as on mobile devices user can not hover finger over menu. So in this case your customer will never know what are you offering and they may not buy anything on your site. Another example is of dynamic height and width. Let’s you set a dynamic height and width on your website so it will adjust on mobile device automatically. In this case user will see small fonts, small images on your site and this is not very clear. So user have to zoom in and if they zoom in, again they have to scroll left and right. So this is not good user experience for any user. Why you need a mobile website or application? As we mentioned earlier, people with mobile devices will search for services from mobile devices so it’s recommended that you need to have a mobile website or application. It increases your customers and business. 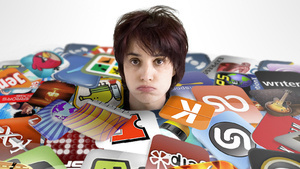 No matter what your business is mobile website and application plays a big role here. It also increases productivity of your business. 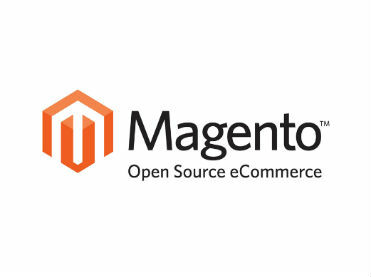 For example if you are an owner of eCommerce site, you need to be connected with your customers every time. You need to reply to their queries, you may want to check your stocks. So how about an application on your mobile which let you do all these stuff? If you are a doctor running a hospital, how about an application that let patients to book an appointment from mobile or check their reports on the go? There are number of such examples. 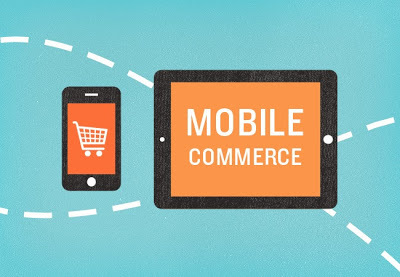 Today no matter what your business is you need something which supports mobile commerce. And that’s where we steps in. We have number of solutions for mobile commerce starting from mobile websites to mobile applications and mobile marketing. Use the mobile commerce and grow your business. Contact us if you need mobile commerce solution.